A robot that makes burgers will be releasing the world’s first robot-crafted sandwich to the public on June 27th. The robot that makes burgers is from the Bay Area-based company Creator – a culinary robotics company. 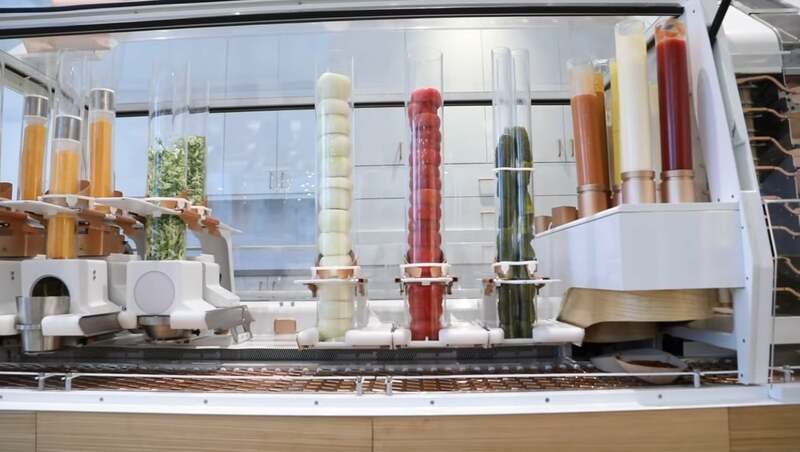 It may seem like a niche business, but robotics and automation is a hot topic in the culinary world with big proponents and critics on both sides of the equation. With the capability to make accurate mass-produced food ready to order, it has the potential to revolutionize the restaurant industry. While critics may claim that this sort of technology could cost people their jobs, it is no doubt the way of the future. The robot that makes burgers is an impressive machine that can handle the burger creation process from beginning to end. From slicing and toasting the burger’s bun to adding custom toppings and cooking the patties, the machine can create a burger from beginning to end in the span of around five minutes. Once the burger is created, a human picks it up and delivers it to the waiting customer: all for the price of $6. Affordable prices and fast service make the idea of a robot that makes burgers a welcome change that may usher in a lot of adjustments to the fast food industry. But this burger-slinging robot was a long time in the making. Creator, the culinary company behind the robot that makes burgers, was formerly known as Momentum Machines and was founded by entrepreneur Alex Vardakostas back in 2012. Armed with the expertise of a team of engineers from major companies like Apple, Tesla, and NASA as well as alumni from elite restaurants around the world, they set to work creating culinary robotics that could turn the way a kitchen functions on its head. The 14-foot-long robot that makes burgers is referred to by the team as a “culinary instrument” rather than a robot, and has been advertised as a more efficient alternative to human cooks. The machine in action is a medley of moving parts that all work together to take a selection of ingredients and transform them into a customized burger that is cooked to perfection and the tastes of the person who ordered. The process that the robot that makes burgers follows is pretty intricate and mesmerizing to watch. We’ve included a video of the process below. First, the bun travels down a chute – propelled by a wooden block and air pressure. Once the bun is in the chute it is sliced, toasted, and deposited in a custom-made container as it prepares for the next portion of its journey. The prepared bread is then passed under sauce spigots – with the eight currently on offer including barbecue, onion jam, shiitake mushroom, and ballpark mustard. Once the bun is sauced up it’s time for condiments. Pickles, tomatoes, and onions are sliced on demand – followed by shredded lettuce and then cheese. The bun meets up with the seasoned and cooked burger at the end of the line, with the patty making for a complete sandwich that is ready and waiting to head out to an appreciative customer. Outside of the robot that makes burgers, there aren’t really any employees needed besides “concierges” that take orders and payments as well as deliver the burgers. Creator will be open for lunch on Wednesdays and Thursdays and will be available to a limited number of diners through an online ticketing system through August. Once September comes around, Creator will fully open to the public. It’s important to note that this robot that makes burgers is equipped as a gourmet machine rather than a simple burger flipper, and it goes to show that automation can extend far beyond a simple fast food sandwich like you’d find at McDonald’s or Burger King. It will be interesting to see how this sort of technology will be implemented in the near future, but there are millions of dollars being poured into culinary automation. It’s likely that Creator and their burger-flipping robot are only the beginning of a future of food expertly crafted by machines. As mentioned above, there will always be some debate as to whether these sorts of automation solutions are helping or harming the food industry, and there’s definitely a potential for jobs to be threatened as time goes on. However, this problem isn’t unique to the food industry by any means. As our society becomes more and more reliant on technology for efficiency and convenience, we will have to start examining our place as workers in a newly-robotic world.